Swami Nigamanand's death has made news because it contrasts so clearly with Baba Ramdev's recently concluded fast. Nigamanand fasted for weeks, outside the media spotlight, against illegal mining along the Ganga. Ramdev, protesting corruption in general and dominating prime time while doing so, wasn't able to keep his fast going for long. 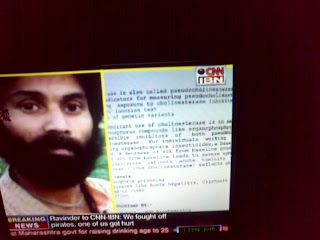 Now CNN IBN is claiming Nigamanand was poisoned. 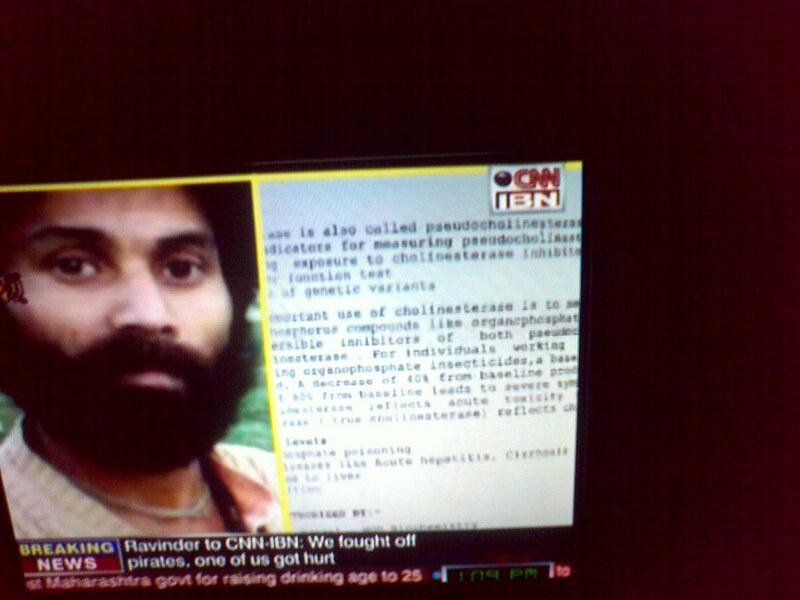 "Swami Nigamanand's pathology report says that he he (sic) died of insecticide which was administered to him during the duration of his stay at the government hospital", the news item on CNN IBN's website says. IBN is running it as one of their top stories on both their Hindi and English news channels. 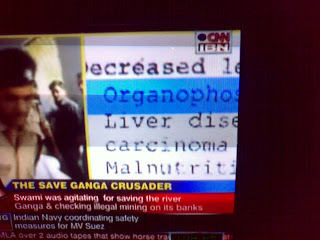 Now, what would a responsible news organisation do, having got hold of a pathology report? I suggest it would contact a doctor to interpret it. No chance of CNN IBN doing that. They're speaking to a District Magistrate and Nigamanand's colleagues, but haven't aired any expert opinions about the report. And it's easy to see why. Here are two grabs of the document from the TV screen. The frame, typically, is never still. Instead we get a series of quick pans and zooms so we can't really read much aside from what the channel chooses to highlight. Given that the man had gone without food for months, what would you conclude from this? That the swami died from malnutrition (option 4); or that somebody administered him instecticide in the hospital (option 1)? CNN IBN has chosen Option 1, and is carrying it as its top new story. Great way to make a living, Rajdeep Sardesai and company. The controversy about the pathology report has overshadowed what, to me, seems a more justifiable line of inquiry, namely, why did the Swami die at all? Even comatose patients are kept alive in hospitals for years, so there really doesn't seem any good reason why the man should have died. The post-morten states he suffered from septicaemia. Again, why would he get septicaemia in a hospital? It seems to indicate laxity in his treatment, but I'm not qualified to make a solid judgement. My doctor friend DS is away in Switzerland, but I hope some other physician will weigh in on the issue. hospital death remains puzzle.newspaper reports that,even in delhi,"reta mafia"is active on shores of yamuna.